Pick up at your hotel in Guatemala City. Transfer to Sumpango Sacatepéquez, This day we will have the opportunity to participate in the All Saints day’s local activities. Where you will see one of the most awesome traditions of Guatemala, Giant kites festival a unique part of this Guatemalan tradition. This is a spectacular display of extravagantly enormous, brightly colored kites that fill the sky. 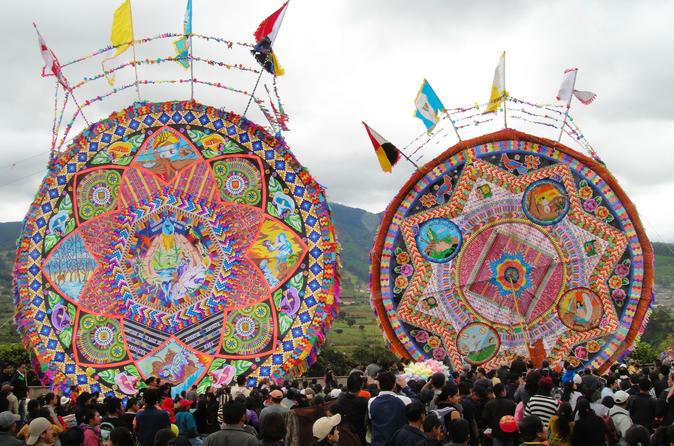 Locals say that these huge kites are used as a way to connect with the deceased, and these kites take over the skies of Sumpango, where the largest kite festivals take place. Transfer to Antigua to take a delicious Lunch (included) Tasting typical dish is eaten exclusively in All Saints day ( Fiambre), Fiambre traditional meal to commemorate this holiday, an authentic cold dish made with more than 50 ingredients that include vegetables, sausages, meats, egg, and cheeses. It is usually eaten with the family gathered either at home or surrounding the tomb of a loved one. At the end of Lunch transfer back to your hotel.